Parts of southeastern Australia turned to recovery Tuesday even as fires smoldered and sometimes raged across sections of the scarred landscape. Tent cities sprung up around Whittlesea, just north of Melbourne, as relief agencies pitched camps for those forced out of their homes. 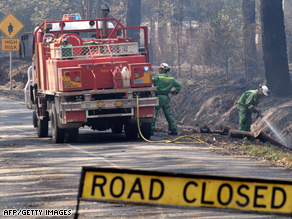 Weekend bushfires “completely wiped out” the towns of Marysville and Kinglake, officials said. More than 20 fires were burning Tuesday, according to the Country Fire Authority. Frustration also brewed as residents desperately wanted to return to their homes, or what was left of them, but were prevented by authorities because of safety concerns. The toll from Saturday’s inferno has grown day by day. Police in the state of Victoria put the number of deaths from the fires at 181 on Tuesday. Watch the devastation brought to homes » Victims included 78 year old Brian Naylor, a former newsreader who reported on the Ash Wednesday bushfires in 1983, some of the worst devastation the country has seen. Naylor was well known in Australia after presenting lead news bulletins on major networks for more than 20 years. Rescue workers say they found the bodies of Naylor and his wife Moiree in their home in the small town of Kinglake West. “We think there will be more deaths,” Police Chief Christine Nixon said. “It’s a major issue … that we’re finding more bodies as we gain access to locations.” Photos: Bushfires leave path of destruction » But there was hope. “We don’t muck around in this country. It will be back to the same in 18 months,” said Ash Phelin, a volunteer worker helping displaced families. “It might not look the same. It’ll be a bit burnt. But it’ll be back.” The scope and scale of the fire brought Monique Locklier to help her bush mates. “Its up the road from where we live,” she said. “It’s the worst tragedy we’ve ever seen and I hope we never see it again.”iReport.com: ‘Thank God we were spared’ Charitable contributions continued to pour into the Salvation Army as Australians were touched by the crisis. “We’re in the midst of this huge financial crisis and people want to give,” Maj. Rodney Barnard said. “The Salvation Army has been running an appeal and we’ve raised in excess of $2 million (Australian).” The need for humanitarian aid is expected to be great, with Prime Minister Kevin Rudd laying out the costs of the fires before Parliament. In addition to those killed, more than 500 people were injured, nearly 1,000 homes were destroyed, thousands were left homeless and 365,000 hectares (901,935 acres) of the Australian countryside have been burnt black, he said. See a map of the area » “The seventh of February will become etched in our national memory as a day of disaster, of death and of mourning,” Rudd said, as he announced that offers of assistance had poured in from around the world, including from France, Japan, New Zealand, Singapore, Thailand and the United States. “All Victorians and all Australians should know that in this darkest hour, they are not alone,” he said. Wildfires are an annual event in Australia, but the unprecedented carnage wrought by the fast-moving infernos, called the worst ever by police, have shaken and surprised the nation. This year, a combination of factors has made them especially intense: a drought, dry bush and one of the most powerful heat waves in memory. News that some fires may have been deliberately set brought a note of disgust from the prime minister. What do you say about anyone like that” Rudd said. “There’s no words to describe it, other than it’s mass murder.” Victoria authorities have banned the use of barbecues and any equipment that might spark a fire. One man has been charged with violating the ban and of “conduct endangering life” in connection with a grass fire, and another has been charged with lighting fires in the neighboring state of New South Wales.